Hey, hey and happy Monday. As promised I have some of my cruise pictures to share with you today. I know that this is a DIY, home improvement blog and there’s not much of that going on lately, but I promise that my travels, and travel posts, are over for the foreseeable future and we will be getting back to work. Hey, you need a break once in a while right? We have been cruising for about 20 years and, as I’ve mentioned before, it’s a great way for me to be able to travel and see new places with my back injury. It’s been about 3 1/2 years since we last cruised and we are so glad that we went. We had a really great time with beautiful weather and we met so many wonderful people. Warning: this post is long with a lot of cell phone pictures. 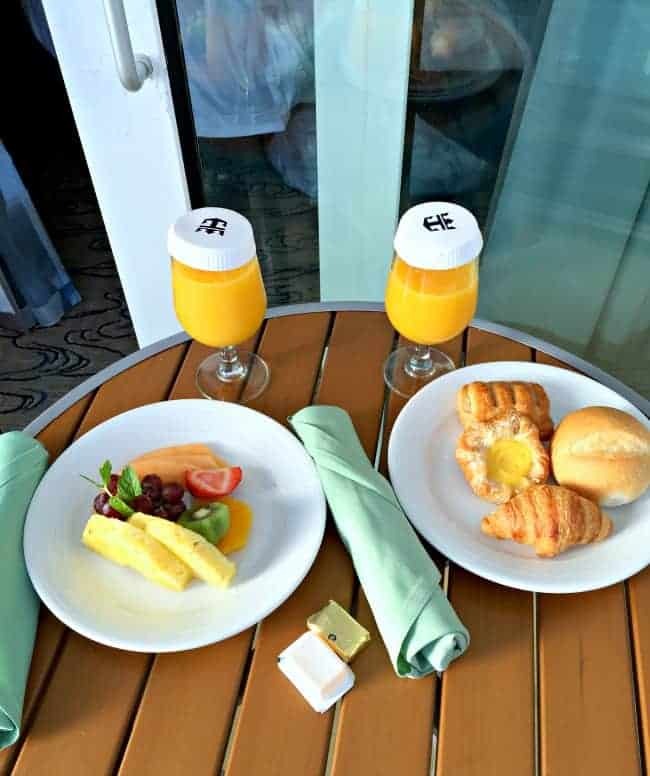 Our cruise started with a flight to Houston and a drive to Galveston (my very first time to Texas ya’ll) where we boarded our home away from home for 7 days…Royal Caribbean’s Navigator of the Seas. Here she is docked in Cozumel, Mexico, our last port of call. We had a balcony room this time and let’s just say that once you stay in one, you never want to stay in any other kind of room. To be honest though, I originally booked an interior room, to keep expenses down, and was offered an upgrade at a great price. Both of us spent a lot of time out there enjoying the beautiful, ever-changing views. My favorite thing to do is to get room service and enjoy some breakfast out in the sunshine. Our first two days were spent cruising at sea. We had fun exploring the ship, relaxing in the solarium and eating and drinking. 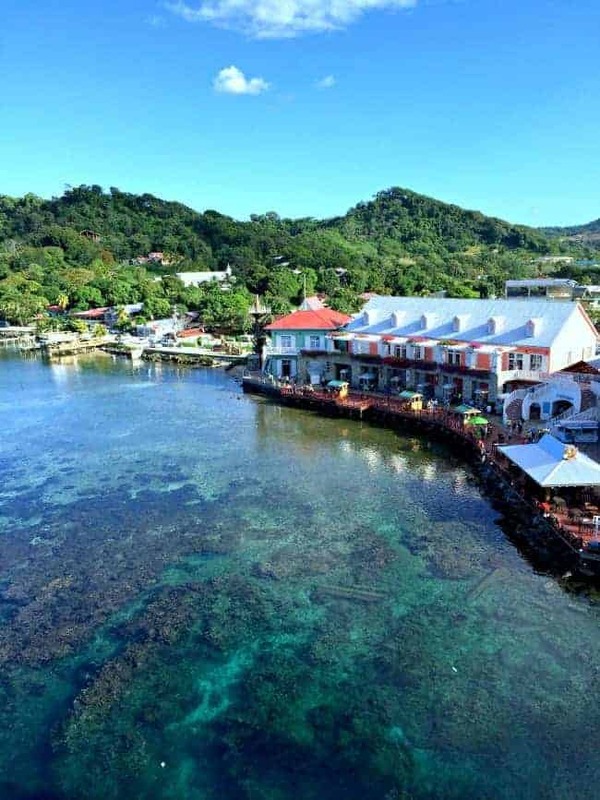 Our third day, Wednesday, we arrived at our first port of call, Roatan, Honduras. This port was a first for us and OMG it was simply stunning. This is just where our ship docked. We ended up taking an island tour with a company I found and researched online. 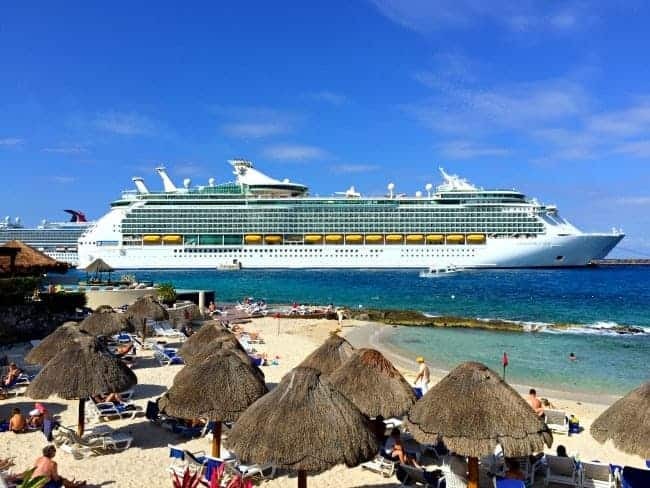 (If you don’t take the ship’s excursions you must always thoroughly check out any company you do an island excursion with…always…no matter which port you go to). We spent the day touring the island and visiting the beach, where we had lunch at a beach bar. What a great day! 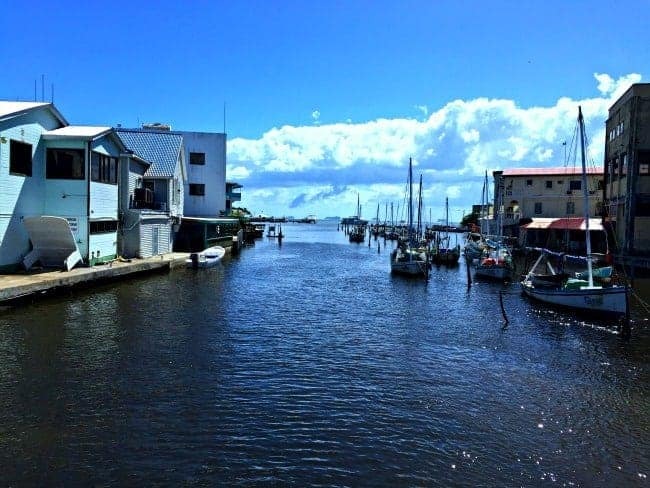 On Thursday we arrived in Belize where we had to take a tender boat to port. We have visited this island before so we just walked around town and the port shops. We were back onboard in time for a Johnny Rockets lunch…yum! 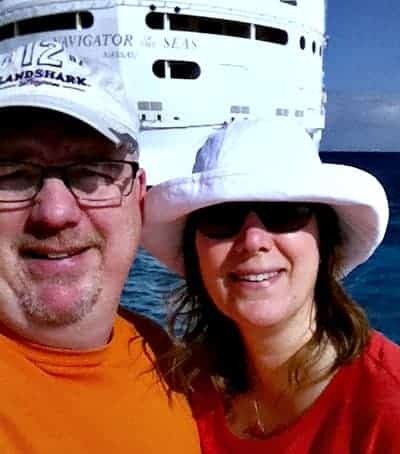 Friday was our last port day and we were in Cozumel, Mexico, a favorite stop for many. 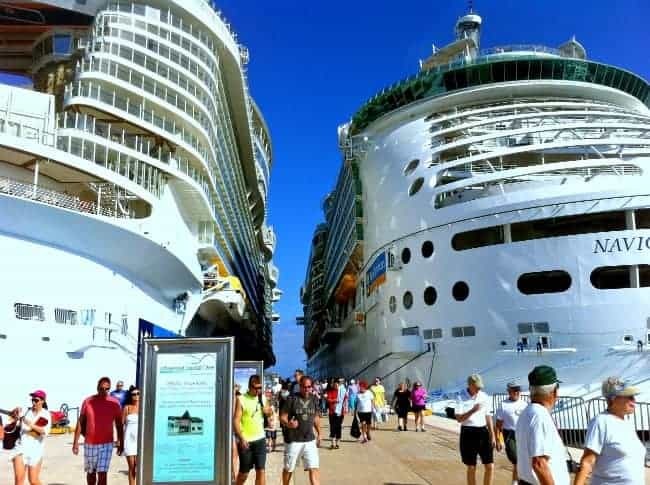 There were 6 ships docked in Cozumel that day so to say it was busy would be an understatement. Our ship is on the right and next to it is the impressive Allure. 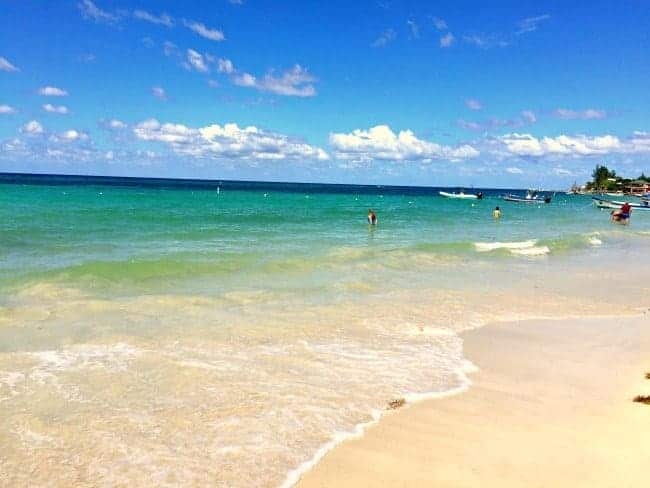 We spent the day at an all-inclusive beach club and we had a great time. All the food and drinks you want and your own personal waiter to serve you. We had fantastic weather and just hung out for the day. Yes, I know it’s rare (because I loathe getting my picture taken), but this is me and Mr. C² together…relaxed and happy…taking a very badly centered selfie. 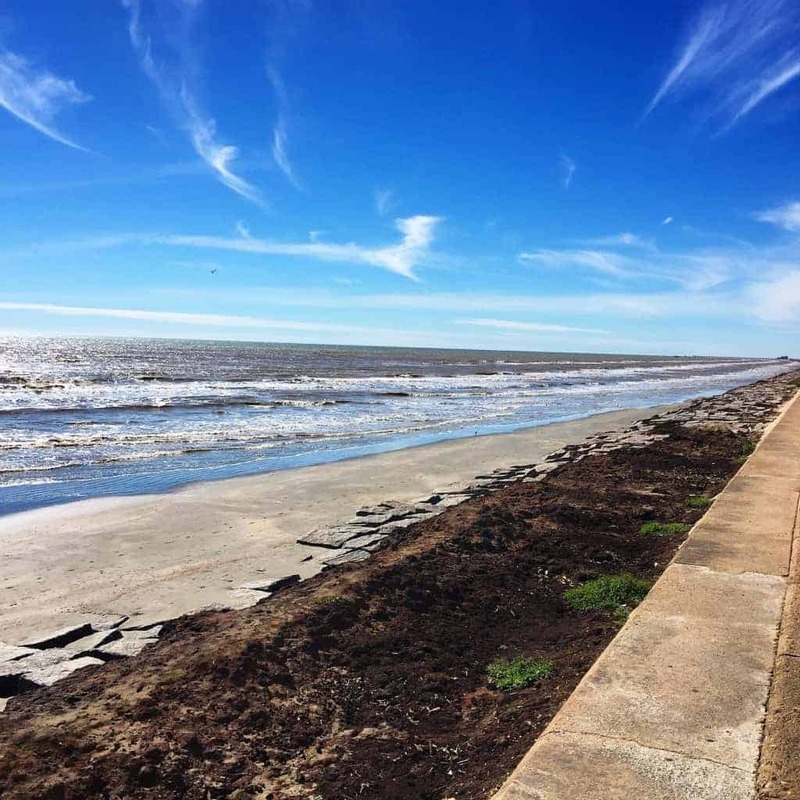 We had one more sea day before arriving back in Galveston. We slept in a little, ate, hung out in the solarium and watched the people who were crazy enough to do the flowrider. It was a great way to end our vacation. 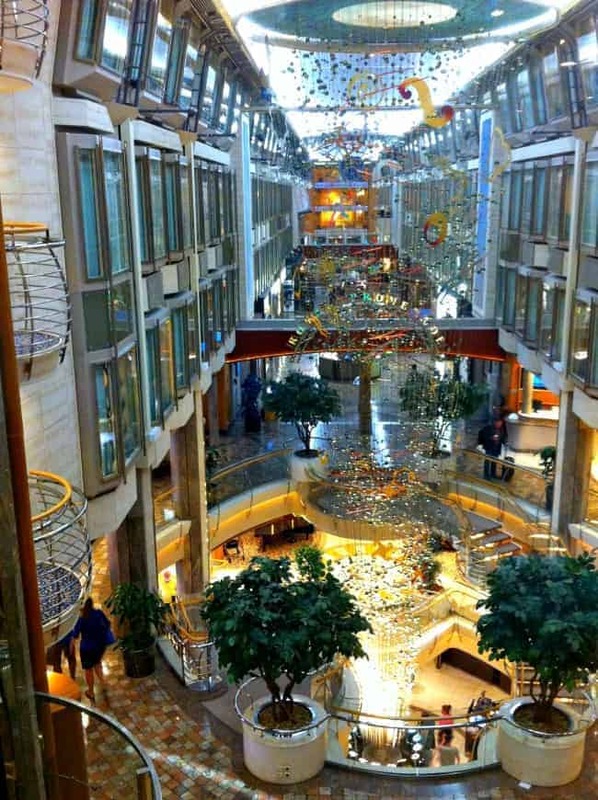 If you’ve never been on a cruise before, this is the Royal Promenade. It’s an indoor walkway with shops, bars, coffee and snacks and live entertainment. A great place to grab a seat and people watch. All too soon we were back in Galveston. We actually ended up staying in Houston for an extra night because of the snowstorm that hit Chicago. We are so glad that we took this vacation though. Having to disconnect from the world, no phones at sea and expensive internet, was really nice and we got to spend some much needed time together, just the two of us. We are so busy that we don’t get to do that very much. If you’ve never cruised before I would highly recommend it. So, have you ever been on a cruise before? Would you go if you had the chance? I enjoyed seeing your pics. You and the Mr are adorable and look like you are really enjoying some time away. I have never been on a cruise but it’s on my bucket list! My Mom didn’t like it, but my MIL loved it especially that she got to see several different islands in one trip. I recently got an email from a travel site I subscribe to with some incredible offers for cruises. My hubs isn’t all that keen on taking a cruise mostly because he reads all the bad publicity but you can get sick from anywhere/anything. I think you just have to be careful and like you say, use the hand sanitizer. Just curious, have you ever experienced motion sickness? I think I’d need those bracelets or something because I know I’d feel the motion and get queasy. Love the balcony you were able to upgrade to. How nice to be able to enjoy a leisurely brekkie while looking out to the ocean. Thanks Shirlee. We really did have a great time. I think we really felt fortunate that we were able to go after a 3 year hiatus. That’s a shame your Mother doesn’t like it. If you look around, there are some great deals for cruises. That’s one of the reasons we were able to go. I think a lot of people feel like your husband does but, like you said, you could get sick anywhere. I actually do get motion sickness but I book a room in the middle of the ship on a lower floor and I use a seasick patch behind my ear. I tried OTC pills and the wristband, but the patch works great for me. You need a prescription though. Most of the time you would never know you are on a ship though, they are that big. Oh Shirlee, having a balcony (and enjoying some brekki) was def a highlight for us, especially since we were in the Caribbean after being in very cold weather. I hope you get to experience a cruise one day. I have a feeling you would love it. 20 years is quite a while. When we first started (15 years ago), midnight buffets were big but you don’t see them anymore and the ships are so much bigger. I hope you get chance to go again. We love it and I’m so glad that we were able to go. Thanks for stopping in. I appreciate it. It looks like you had such a great time- I am dying for a vacation. Do you always cruise Royal Caribbean? We’re considering going on a cruise later this year and I’m not even sure where to start. Hi Jessy. We have been on Carnival, Celebrity and Royal Caribbean but we’ve been pretty loyal to RC for the last several years. They just have the things that we enjoy in a cruise. I would start with the itinerary you would like first, where you want to go. Then look at the cruise lines that offer those itineraries. Carnival is more of a party atmosphere, Celebrity is more quiet with an older crowd, and RC is somewhere in between. If I can answer any questions for you, please don’t hesitate to ask. I hope this helps. Looks beautiful! I need to see those beachy photos today since we are expecting more snow on the east coast tonight. Ugh. Thanks for sharing! Ugh, so sorry about the bad weather you have been having Shelley. We had a winter like that last year, with lots of snow and negative temps, so I know how you are feeling. Glad that my photos cheered you some. Thanks so much for stopping by. Kristi, your photos are wonderful! I don’t want to look out my window after seeing all that sun and blue skies! All I have to look at is snow and more snow!! Never have been on a cruise and probably will not since all the scares with people getting sick. I have a friend who goes all the time and has never had any problems though. Thanks for letting us see your photos and you and Mr. C2 look very happy! Thanks MJ. I always hesitate to show vacay pics because this is a home decor blog after all. I know what you mean about the snowy scenery. I’m tired of looking at it too, and you probably have so much more there. I heard about norovirus hitting another ship right after we got home. I don’t really think about it when I’m on the ship. They have hand sanitizer at each food venue and someone standing there to make sure you use it. I’ve been on 15 cruises and have never had a problem before (hopefully I didn’t just jinx myself 😉 ). The Mr. wasn’t thrilled that I showed his face (well half of it really) but I thought it was a good representative of how much good this trip was for us. Thanks much for stopping and and saying hello. I always appreciate hearing from you. Ohhh it looks beautiful! I entirely understand never wanting an interior room after being on the balcony! It’s like not being able to see out the window on an airplane. 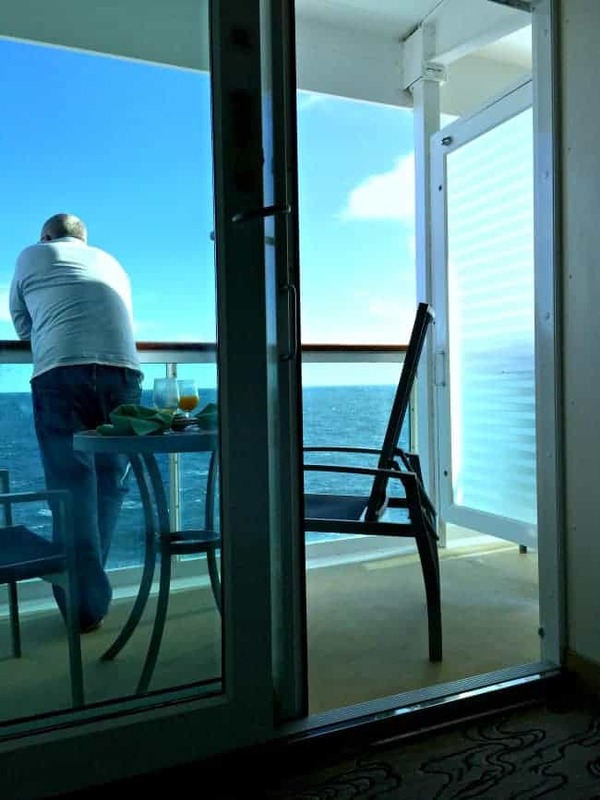 Sure, it’s alright, and you can look through so long as you can see past the people who have the window seats (or, in the case of a cruise, go up on deck), but it’s really not nearly as awesome!! Don’t get me wrong, I would stay in an interior room again…it was just really nice to be able to walk out and see the water. 🙂 I had forgotten how much I missed the ocean (in the 3 1/2 years since we moved from Florida to Illinois). Those ports of call look fabulous! I have not been on a cruise but, believe it or not, one of my dresses went on a cruise without me! Years ago, I loaned a semi-formal dress to a friend who was going on a cruise. Took me a long time to get rid of that dress because of where it had been (I haven’t been that size in 30+ years, actually)!